Before we get into the technology, let's have a chat about screens. After flirting with 3-D television earlier in the decade, manufacturers have decided to cease investing in the technology, which means there was no 3-D television at CES this year. Instead, we saw upgrades to traditional screen technology. The most talked about was LG's rollable screen television. It's not quite origami, but it's close. Imagine those old roll up projector screens integrated into a low TV unit, with a 65 inch OLED (organic light-emitting diode) TV screen and 4K resolution. The screen also allows you to partly roll it down to remove those annoying top and bottom black bars, used in films of a wider aspect ratio. In addition to rollable televisions, a number of brands showcased their 8K televisions. Unfortunately the increase in image quality won't mean much for Aussies, other than a potential drop in the price of 4K televisions. Here's why. Currently, the maximum broadcast quality of free-to-air television in Australia is high definition (1920 x 1080 pixels). Some secondary channels are broadcast in standard definition (720 x 576 pixels). If you're watching on a 4K (3840 x 2160 pixels) or 8K (7680 x 4320 pixels) screen, the image will be a much lower quality than you would expect, essentially pixelated. 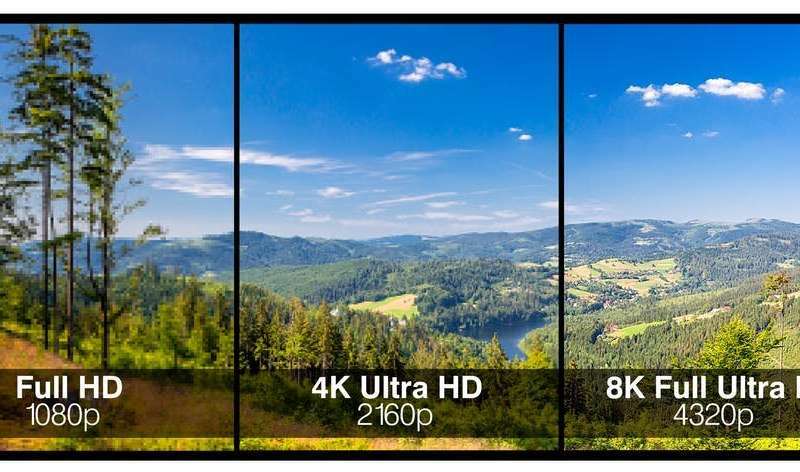 So take note anyone planning to purchase an 8K television in the near future: you may have difficulty accessing image quality that will match the screen's potential. LG Display rollable OLED TV hands-on. One technology that has the potential to deliver higher image quality is video streaming. Operating via the internet, video-on-demand (VOD) services could adapt far quicker than Australia's traditional broadcasters. We recently saw the launch of Network Ten's subscription video-on-demand (SVoD) service, Ten All Access. It integrates Ten's local programming with programming from the service of their US owner, CBS All Access. Stan, one of the original SVoD services launched in Australia, has had a recent upgrade, obtaining the rights to stream Disney content. Disney has announced in will launch its own VOD service in 2019, although it's currently unclear whether it will be available outside of US. But the deal with Stan will give Disney an indication of Australia's appetite for its content. Netflix already offers a 4K option, but recommends "a steady internet connection speed of 25 megabits per second or higher". According to a 2017 Ookla Speed Test Global Index, Australia was ranked 55th in the world for fixed broadband. With an average download speed of 25.88 Mbps. This speed is to be shared across devices in the home, making the Netflix 4K recommendation unattainable for many.